These rugged 65mm PTFE-Glass Flow Meters offer solutions to low to medium flow range measurements of highly corrosive or ultra-pure liquids and gases. Wetted inert components are surrounded by structurally rigid anodized aluminum. The resultant design represents a unique combination of a rugged mechanically rigid frame and chemically inert wetted parts. 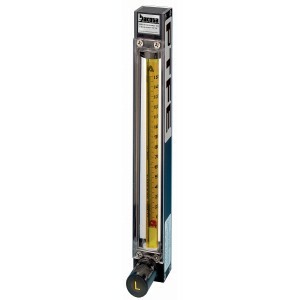 This rotameter comes with a CV® Utility Valve Cartridge. CV® Valve Cartridges are designed for adjusting flow rates in applications where high resolution metering regulation is not essential. These rugged 150mm PTFE-Glass Flow Meters offer solutions to low to medium flow range measurements of highly corrosive or ultra-pure liquids and gases. Wetted inert components are surrounded by structurally rigid anodized aluminum. The resultant design represents a unique combination of a rugged mechanically rigid frame and chemically inert wetted parts. 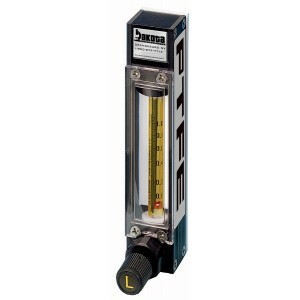 This rotameter comes with a CV Utility Valve Cartridge. CV® Valve Cartridges are designed for adjusting flow rates in applications where high resolution metering regulation is not essential.